In the presence of Indonesian Vice President Muhammad Jusuf Kalla; Indonesia's state-owned PT Pertamina and Saudi Aramco, the state-owned oil company of Saudi Arabia, have signed a Heads of Agreement (HoA) to formalize key business principles for joint ownership, operation and upgrade of the Cilacap Refinery located in Central Java, Indonesia as part of Pertamina’s Refinery Development Master Plan (RDMP). The signing was held during the Vice President’s inauguration of the newly commissioned Residual Fluid Catalytic Cracking (RFCC) facility at the Cilacap Refinery, and the kick off of the Blue Sky project, both of which are designed to produce higher quality gasoline. Also present were ministers from the Indonesian cabinet; the Saudi Arabian Ambassador to Indonesia Mustafa Al Mubarak; President and Chief Executive Officer of Saudi Aramco Amin H. Nasser; and President Director and Chief Executive Officer of PT Pertamina Dwi Soetjipto. The proposed Cilacap Refinery upgrade will enable the refinery to process more sour crudes, meet high quality product specifications (Euro IV) and produce basic petrochemicals and lubricant base oils. The capacity expansion to 370 MBD will help Indonesia meet its increasing demand of refined products, lubricant base oils and petrochemicals. The agreement includes a long-term supply agreement for Arabian crudes to Cilacap refinery. This HoA will pave the way for the next phase of development within the scope of collaboration between the two parties. The Basic Engineering Design Study for the Cilacap refinery upgrade is expected to commence soon and be completed by 2016. RDMP is part of Pertamina’s mission as a national energy company to produce and market fuel products for Indonesia. RDMP will increase the competitiveness of Indonesia’s refineries while increasing domestic supply security. “Indonesia is a rising powerhouse in the global economy, and has long deep rooted trade and cultural ties with Saudi Arabia. It’s refining sector has enormous potential, and with Indonesia’s fast-growing demand for refined products, Saudi Aramco’s role in Cilacap can help fuel this country’s coming era of development and prosperity,” said Amin Nasser, President and Chief Executive Officer of Saudi Aramco at the signing ceremony. Participation in the RDMP will offer Saudi Aramco a major growth component of its global Downstream expansion portfolio aspiration, designed to make Saudi Aramco the world’s leading integrated energy and chemicals company. The investment would take place within a high growth petroleum demand in South East Asia which has been earmarked in the company’s downstream strategy. 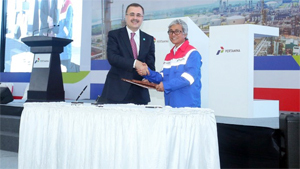 In July 2014 Pertamina offered Saudi Aramco and other strategic partners the opportunity to participate in its RDMP to upgrade and expand five existing domestic refineries (Cilacap; Balongan; Dumai; Plaju; and Balikpapan) from 820 MBD of aggregate processing capacity to 1,680 MBD Saudi Aramco was selected by Pertamina as a strategic partner for three of the five refineries: Cilacap and Balongan in Java; and Dumai in Sumatra. Saudi Aramco signed a MOU on December 10, 2014 giving the company exclusivity to conduct a feasibility study jointly with Pertamina for the three refinery expansions and negotiate key business principles. About PT Pertamina Pertamina is Indonesia’s state-owned integrated oil and gas company. We are committed to an ongoing process of transformation and continuous improvement that will lead to our achieving global standards of operational, environmental, and corporate performance. As a national oil company, we are committed to balancing profitable performance with our public service mandate. Pertamina has 57 years of experience in the challenging geological environment of Indonesia, were pioneers in the development of Liquefied Natural Gas (LNG) and now have operations in six countries. Our businesses include the exploration and production of oil and gas; the refining, manufacturing and marketing of oil products and petrochemicals; and the development of biofuels, geothermal power and other sustainable alternative energy sources. Pertamina has operations and facilities throughout Indonesia. Pertamina’s employees serve the energy needs of over 240 million Indonesians.